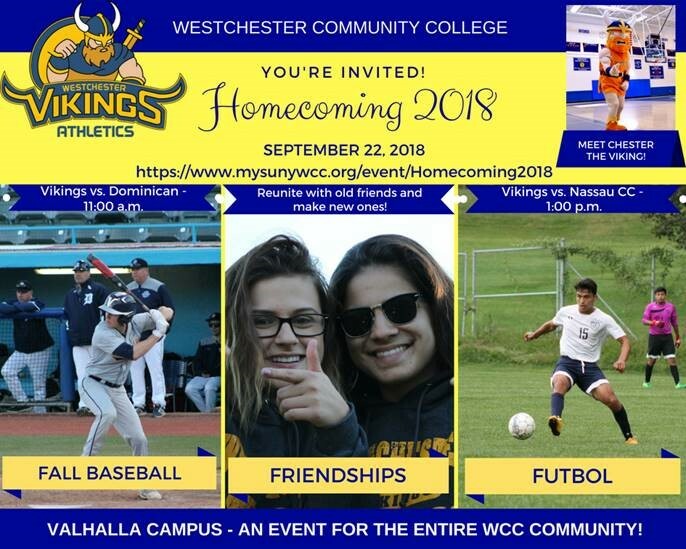 Our faculty, staff, and administration are welcome to join us, cheer on our Vikings, celebrate our incredible athletic community, and welcome back our alumni. The day begins with a fall Baseball game against Dominican College at 11:00 a.m. At 1:00 p.m., our Soccer team hosts Region XV arch-rival Nassau Community College. Chester will be there to take selfies with everybody who attends, and there will be plenty of food and other Westchester Community College goodies to offer. We will have t-shirts for anybody who pre-registers, and other giveaways as well. We hope to see you there! Go Vikings!